We’re supposed to have measurable snowfall tonight, so this seems like a good time for this post. I picked the last tomato on October 23, which was the night of our first killing frost. I must admit that this was not a great garden year. We planted too late, in a shady spot with newly tilled ground full of weed seeds, and then had a cool and rainy summer. In hindsight, I probably shouldn’t have put up the clothesline, and we owe the whole region an apology. The tomatoes, peppers and cukes did as well as could be expected given the weather. However, we won’t be training them up the garden fence again as long as we have geese, who think that both tomato and cucumber vines are yummy. The celery did OK too. We tried to get the big supermarket kind, but Johnny’s vendor had a crop failure so we got the small stuff from someone on EBay. We’ve been eating it since August and there’s still quite a bit out there. The potatoes and onions were just planted too late. The onions bulbed up and the potato vines died on the sun’s schedule rather than after growing to full size. We did get our first-ever shallots this year though. The peppers did better than expected, which is odd because of the lack of sun and so much rain, but we’ll take it. The eggplant did well too. Broccoli and cabbage went nowhere all summer, then gave us a small fall crop. Weird. Finally, we had a big patch of dried beans, largely because of schedule. There wasn’t a whole lot else for us to plant by then. We had Turtle (black), Pinto and Jacob’s Cattle. 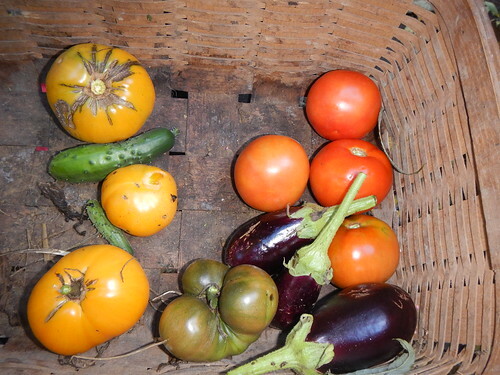 All of them were only partially ripe when they were frost-killed on the 23rd. It turns out that the Pintos and Turtles are both climbers, while Jacob’s Cattle are bush. Nonetheless, the turtle beans did quite well, better than the Jacob’s Cattle did in 2011. The other two varieties were disappointing. We also planted many more black beans, but the relative number of pods per plant was obvious when I harvested. We’ll be trying all three varieties again if for no discover if the problem was weather or shade. This entry was posted in Beans, Broccoli, celery, Cucumber, Onions, parsnips, Peppers, Potatoes, Tomatoes, Weeds. Bookmark the permalink. Post a comment or leave a trackback: Trackback URL.